Baeten’s look for new varieties, in addition to the old favorites, to provide you with the best selection for your garden. Enjoy classic Lilac fragrance for months instead of weeks! This revolutionary new kind of Lilac, blooms in spring and then again throughout the summer. It does go through a rest period in the heat of the summer, then flowers again. This compact, mounded variety fits easily into any landscape, and is ideal as a foundation planting or as part of the mixed border. You can even include it into perennial beds. Double Play® Spireas have both colorful flowers and colorful foliage. Rich purple red new growth in spring complements deep pink summer flowers. You’ll get months of vibrant color from this adaptable, easy to grow plant. A new dwarf form of the popular Limelight Hydrangea, Little Lime sports the same great flower power but in a smaller package. Attractive green summer flowers turn pink in fall. This hardy selection is excellent for use in mixed border or foundation plantings. Sturdy stems are good for cut flower arrangements. Grows 3-4’ tall and wide. 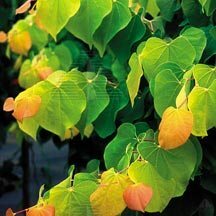 Bright, rosy-apricot colored new growth gives way to golden tangerine heart shaped leaves that persist well into fall.Spring time display is riveting. Fantasticspecimen for small gardens or stunning mass dispalys.